presentation to render the surviving masterpieces of Aeschylus, Sophocles, and Euripides in an English so lively and compelling that they remain the standard translations. Today, Chicago is taking pains to ensure that our Greek tragedies remain the leading English-language versions throughout the twenty-first century. In this highly anticipated third edition, Mark Griffith and Glenn W. Most have carefully updated the translations to bring them even closer to the ancient Greek while retaining the vibrancy for which our English versions are famous. 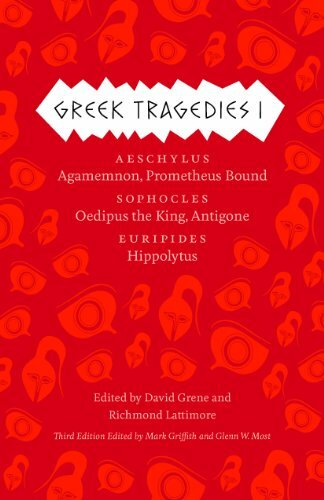 This edition also includes brand-new translations of Euripides’Medea,The Children of Heracles,Andromache, andIphigenia among the Taurians, fragments of lost plays by Aeschylus, and the surviving portion of Sophocles’s satyr-dramaThe Trackers. New introductions for each play offer essential information about its first production, plot, and reception in antiquity and beyond. In addition, each volume includes an introduction to the life and work of its tragedian, as well as notes addressing textual uncertainties and a glossary of names and places mentioned in the plays. In addition to the new content, the volumes have been reorganized both within and between volumes to reflect the most up-to-date scholarship on the order in which the plays were originally written. The result is a set of handsome paperbacks destined to introduce new generations of readers to these foundational works of Western drama, art, and life. Mark Griffith is the Klio Distinguished Professor of Classical Languages and Literature at the University of California, Berkeley. Glenn W. Most has taught at the Universities of Yale, Princeton, Michigan, Siena, Innsbruck, and Heidelberg. Since 2001 he has been Professor of Greek Philology at the Scuola Normale Superiore di Pisa, since 1996 he has been a visiting Professor on the Committee on Social Thought at the University of Chicago; recently he has also become an external scientific member of the Max Planck Institute for the History of Science in Berlin. Graham Hurley is an award-winning TV documentary maker who now writes full time. He is married and has grown up children. He lived in Portsmouth for 20 years but now lives in Exmouth, Devon.David Grene (1913–2002) taught classics for many years at the University of Chicago. He was a founding member of the Committee on Social Thought and coedited the University of Chicago Press’s prestigious series The Complete Greek Tragedies.